LOS ANGELES, CA, UNITED STATES, February 7, 2019 /EINPresswire.com/ — Nestled in the gorgeous city of Toluca Lake, SANTUARI RESTAURANT, an exquisite new venue offering fresh Californian cuisine with delicious Mediterranean accents, welcomes guests for weekend brunches, starting this Valentine’s Day weekend, Saturday, February 16th & Sunday, February 17th, 2019, from 11:00 AM to 3:00 PM. Saturday and Sunday brunches will commence on February 16th and 17th from 11:00 AM to 3:00 PM and will continue to take place for all future weekends. 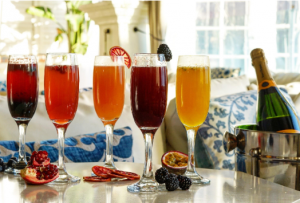 Santuari’s brunch will feature a special new fruit and sparkling wine creation, the “Santimosa”, a cousin of the Mimosa, in blood orange, passion fruit, pomegranate, blackberry, and blueberry flavors. Each Santimosa is only $5.00! Also featured is a house juiced Bloody Mary with Applewood Smoked Bacon. Not enough for you? Try a Strawberry Gelato coupe drenched with Spanish sparkling wine. Recently announced as winner of “Best New Restaurant – 2018” by the “Best of Los Angeles Award” community, Santuari Restaurant has been a hit since its opening, with items on its diverse menu that everybody can enjoy. Vegetable Egg White Frittata with delicious roasted mushrooms, peppers, shaved vegetables, and meyer lemon gremolata. "I recently attended the Holiday Brunch at Santuari, and I have never had a finer dining experience," raves Michael Levine, a satisfied diner, "the menu and atmosphere are exquisite, and I cannot wait till this restaurant gets the recognition it deserves."